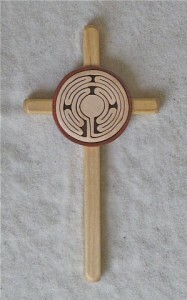 The labyrinth of this cross is a modified five-circuit design based on the larger 12 circuit one at the Chartres Cathedral in France. The hand-cut labyrinth is 1 ½ inches in diameter. It is set into a medallion made of padauk. The cross is made of white birch and is finished with a clear lacquer.